Ray Guns – impossibly marvelous and depending on how strict you are with your Steampunk, they either just catch the latter end of it, or are soundly stationed in the ‘pulp’ end of the spectrum. 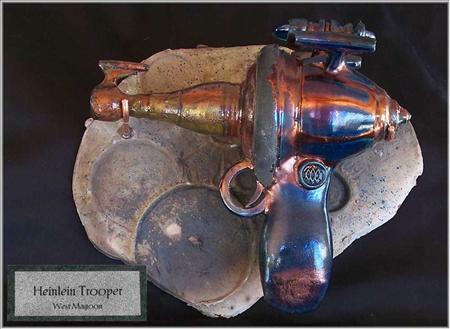 The ones above are wonderfully finished – they’re made using raku firing techniques for ceramics, and they’re known as Raku Ray Guns, by West Magoon. Most of them (there are several styles) are named for classic sci-fi authors, so expect to see the Burroughs Barsoom MkIV, the E.E. Doc Disintegrator and the above Heinlein Trooper. They’re not cheap, mind you, so do not expect to pick up a matching pair without some consideration (nor indeed would the particular firing method result in any two looking identical) but they are handsome devices, mounted on moon-crater styled backplates. Thank you so very much, Ms Libolt, for pointing them out to me!